A section of the largest image of the Milky Way ever created. It was stitched together from 800,000 individual infrared images taken by NASA's Spitzer Space Telescope. The world?s largest picture of the Milky Way, taken byNASA?s Spitzer Space Telescope, is being unveiled today at the AdlerPlanetarium in Chicago. The new image is of galactic proportions, covering an areathat is 120 feet (37 meters) long, 3 feet (1 meter) tall at its sides and 6feet (2 meters) tall in the middle, where our galaxy's central bulge isdepicted. The panorama represents the combined effort of two Spitzersurvey teams, who used two of the telescope's onboard instruments, the InfraredArray Camera (IRAC) and the Multiband Imaging Photometer. The large image was made fromstitching together 800,000 individual pictures taken by Spitzer, for atotal of 2.5 billion infrared pixels. It covers an area of the sky about aswide as a pointer finger and as long as the length of arms outstretched, whichmight sound small, but covers about half of the entire galaxy, says RobertHurt, of the Spitzer Science Center at Caltech. 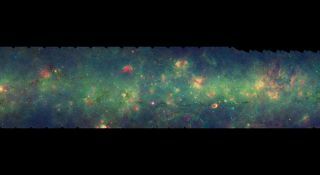 "This is the highest-resolution, largest, mostsensitive infrared picture ever taken of our Milky Way," said Sean Careyof the Spitzer Science Center, who led one of the teams that created the image. "I suspect that Spitzer's view of the galaxy is thebest that we'll have for the foreseeable future. There is currently no missionplanned that has both a wide field of view and the sensitivity needed to probethe Milky Way at these infrared wavelengths," said Barbara Whitney of theSpace Science Institute in Madison, Wis., also part of one of the Spitzerteams. The image is set to be unveiled by the scientists whocreated it at 3 p.m. EST at Chicago's Adler Planetarium.